Be sure that you have an application to open this file type before downloading and/or purchasing. Do you want your students to learn vocabulary like a game? Fun learning about Thanksgiving? And what if we use our digital devices or the Interactive Board? They love it!!!! 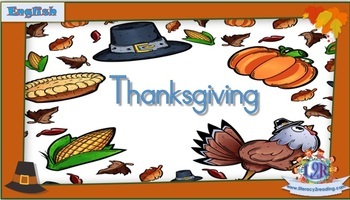 PowerPoint-Interactive activities with images, vocabulary, letters,... about Thanksgiving in English. The activities are meant to be used in addition to reading with children every day. - Vocabulary flashcards in English. - Worksheets to work on word formation in English. All the kits of activities are differentiated and meant to be used in Prek through 2nd grade, as well as other groups studying English as a Foreign/Second Language. or the Dual-Language versión in English and Spanish, saving some money!!! 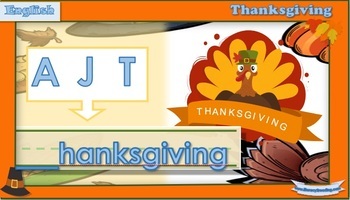 or Maybe "Thanksgiving ABC card/word wall in Spanish + Activities"? Teachers Pay Teachers is an online marketplace where teachers buy and sell original educational materials. Are you getting the free resources, updates, and special offers we send out every week in our teacher newsletter?